Washington – During a quick trip to the nation’s capital, Gov. Ned Lamont met with foreign businessmen, spoke to U.S. Transportation Secretary Elaine Chao about tolls, and explored expansion of the use of offshore wind energy in Connecticut. On Wednesday, Lamont attended a gathering hosted by the Organization for International Investment, a group that looks out for the interests of foreign companies doing business in the United States. Among those attending were executives from Boehringer Ingelheim, a pharmaceutical company whose U.S. operations are located in Ridgefield. “I urged them to have a bigger footprint in Connecticut,” Lamont said of the companies at the event who do business in the state. The governor also met with Chao on Wednesday over the issue of tolls, which has bedeviled him back home. He said they discussed how tolls are established in other parts of the nation, including Indiana and Virginia. “We talked about if and when that would be like,” Lamont said of the transportation bill, and how the state should fashion its list of federal priority projects if Congress ever approves the legislation. Another part of the discussion related to the 20 percent in transportation matching funds Connecticut must supply. On Thursday, Lamont attended an event at the Canadian Embassy hosted by the National Governor’s Association and the embassies of Australia, Canada and Denmark. The meeting centered on pushing for more use of offshore wind energy though mandates, incentive programs and the removal of regulatory and policy barriers. 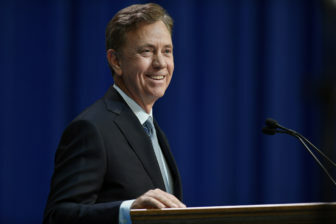 Lamont said he met with representatives of Orsted, a Danish company that owns wind areas off the coast of New England. Connecticut has already agreed to purchase offshore wind power from one of those areas. There’s an effort in the state legislature to increase the amount of offshore wind energy allowed in Connecticut. Lamont also attended an NGA event aimed at increased recruitment of minority teachers. “Forty percent of the students in Connecticut are children of color and only 10 percent of the teachers are minorities,” Lamont said. Black and Hispanic prospective teachers are winnowed out in the teacher certification process, which includes passing teacher-prep exams and clearing other hurdles. Lamont said there was a discussion about pairing up prospective minority teachers with seasoned educators to learn the ropes. He said he met with “some folks interested in investing money” in those types of projects. The governor’s visit to Washington D.C. was busy, but brief. He met with Rep. John Larson, D-1st District, but otherwise steered largely clear of Capitol Hill. “I didn’t even know the governor was in Washington,” Sen. Chris Murphy, D-Conn., said on Wednesday.